This little combo in the first instance had blown the mains fuse (630mA anti-surge under the IEC mains socket), and sometimes its just that the amp doesn’t like being turned off without first switching off the standby, because it can cause a surge. One or two things came to light on this one. An intermittent heater cathode short on an output EL84 was bad news. That can do nasty things to the output bias, and destroy the lot. So the output stage had to be revalved. But that threw up an interesting related issue. The phase splitter valve (that’s usually the one next to the four output valves) is supposed to give exactly the same signal level output to both halves of the output stage. If it doesn’t, the hundred quid you spent on your sooper-dooper-mesa-groove output valves was a waste of money. Because the input to the output stage (from the phase splitter) has to be exactly right or the big bucks you just spent on your output valves will be accurately amplifying something that was wrong in the first place. So a decent ECC83 (sometimes ECC82) in the phase splitter is much more important than the output valve matching, and a lot less money. Last off, the output valve complement of the Laney is a lot like the Vox AC30. But…. the biasing is altogether different. But a dud output valve in either can cause a lot of trouble. 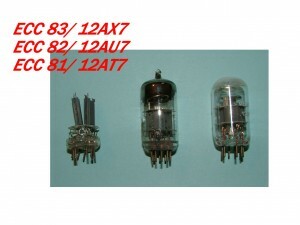 On the last blog, the construction of an ECC 83 valve was discussed, and, in a nutshell, it’s a triode; it consists of a vacuum sealed glass envelope, inside that a rectangular section tube called the anode, inside that a coil of wire called the control grid, inside that a tube called the cathode, and inside that, the heater, which is also a coil of wire. So I suppose, 3 concentric tubes with the heater in the centre. All that, twice, because the ECC83 is a double triode. There is one valve that is simpler than the triode, and that’s diode. It has an anode, a cathode and a heater. In some diodes the heater is the cathode. 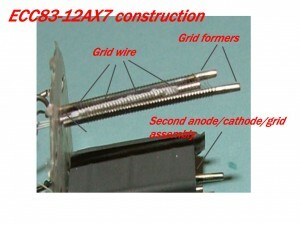 An example of this kind of valve would be the GZ34 or 5Y3 and they are diode rectifiers. They’re a bit different because they’re bridge rectifiers, but the same principles apply. The diode is the simplest valve to explain and it goes a long way to showing how they all work. If we stick a positive voltage to the anode, and a negative to the cathode, it won’t do anything. 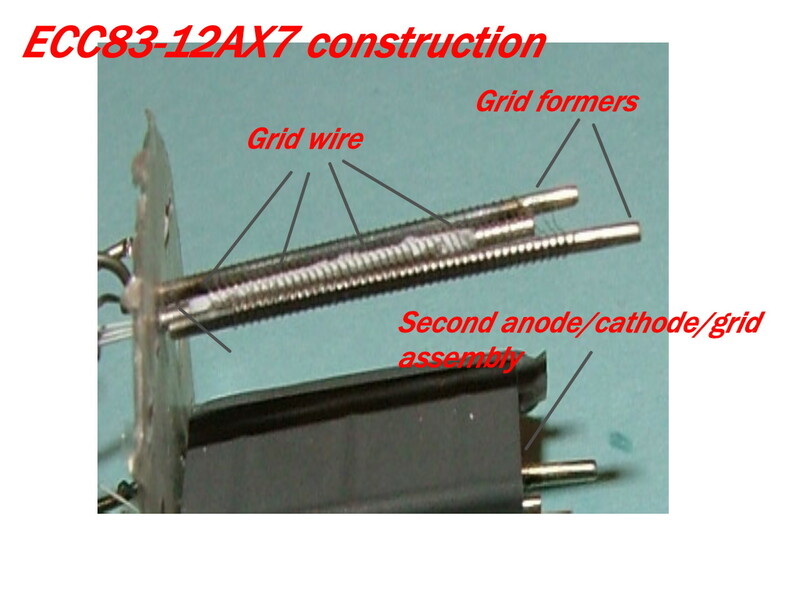 The anode is the outer box and the cathode the inner tube. Basically all there is inside the valve are two unconnected pieces of metal, so it’s like an open switch. If, though, we heat the cathode, a current will flow from positive to negative. Conventional current flow is always positive to negative so that’s as we’d expect. Water doesn’t flow uphill, and it’s as normal as that. But what use is that, and why does it work when the cathode is heated, and not when it’s cold? If we put an alternating signal (current) (this is the stuff that comes out of the wall socket) across the anode and cathode, the valve will allow current to flow when the anode is positive, and not when it’s negative. So we get current flow in one direction only, which means we can convert the alternating current (a.c.) to direct current (d.c.), and this what electronic gear of all sorts needs. So the first thing that happens in an amp is that the mains in, is converted to d.c. by the rectifier. How does it work? Well, you can take this into the realms of quantum physics, but they’re all theories, and only last until another comes along. However, the conventional explanation is probably not too silly. The heated cathode emits electrons; a lot when it’s hot, and hardly any when it’s cold. So when it’s hot there are a lot of electrons hanging around having been thrown off the cathode by the energy supplied by the heater. If then we stick our positive voltage onto the anode, this has the effect of drawing the electrons towards it, because positive charges attract negative charges, and as electrons are negatively charged, they are pulled up to the anode, if the voltage is high enough. The electrons flow though the valve by being emitted at the cathode and attracted to the anode. So it’s a bit like a one way switch (the electrons won’t go back the other way, because the cathode negative charge repels them) but not quite. The valve can only deal with so much current, and beyond that, the output ‘sags’ and this is why a valve rectifier sounds so different at high power outputs. It behaves as a very complex compressor. And, even worse than that, so far as digital modelling is concerned, a very unpredictable complex compressor. Digital does not like unpredictable, so it’s impossible to simulate accurately. Mainly because there’s little that’s accurate to model. So that’s more or less it for a diode valve operation. (ish) Next up we’ll find out what’s happening in a triode. Tea time. The big physical difference between valves and transistors, (aside from the obvious stuff, like valves are bigger, and they’re glass) is that a valve is a constructed object. It has different bits in it, inside the glass; but a semiconductor of any type, is, mostly, a piece of metal. Another fairly obvious difference is that if you drop a valve, it won’t like it at all, but a transistor might even enjoy the trip. But they work in not completely dissimilar ways. In the case of a mosfet, in quite similar ways; considering they look as similar as a camel and and ostrich. Below is a pic of three valves. The middle one is a working one, the right hand side is the same but the white discolouration shows it has a crack in it somewhere, and the other, I hit with a hammer. Apart from getting wicked sort of buzz from that, it was done for a reason. The pic underneath that one, shows the valve taken to bits, and the bits are marked; not bad place to start? Below is an exploded(?) image of the above ECC83. It could however, be any of the valves quoted, the difference being in their electrical properties not their construction. If we go back to the one I hit with a hammer, it’s obvious that there are two identical bits in it. They are the two grey oblong boxes. There are two because an ECC83 valve is a double valve (a double triode, in fact) and that’s what the ‘CC’ stands for. ‘C’ stands for a triode and ‘CC’ means there are two of them in the same glass bit. Complicated eh? The glass bit is called the ‘envelope’. The above pic shows the ECC83 I hit with a hammer, a bit more distressed. The grey box at the bottom is the anode. Above that is the half of the valve I’ve taken to bits some more, and this shows the grid, which is the spiral wire supported by the two formers. In the middle of the grid, is the silver coloured tube of the cathode, and inside that, which you can’t see, is the filament heater. This is the same sort of thing as you might find in a light bulb. The Grey box of the anode slips over the outside of this lot, and connections are made to the pins at the bottom, which can be better seen in the top pic. “Valves sound great” we hear the constant drone, from folks, (usually folks selling ‘em) and I for one completely agree. But how can this bag of bits sound like anything at all? This is where the next blog will take us, I hope. Time for a cuppa.